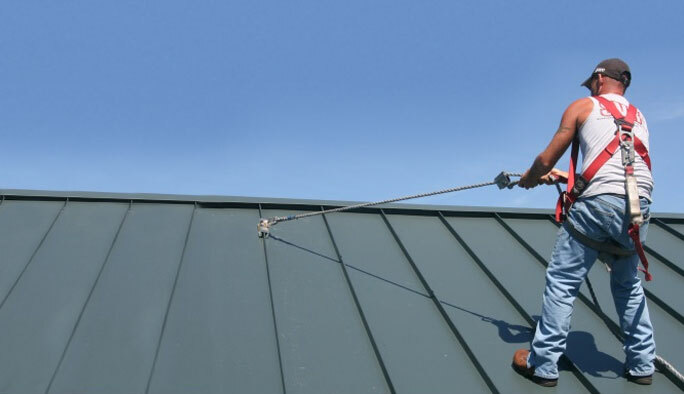 Fall Protection Distributors, LLC is the Master Distributor for the Standing Seam Roof Anchor line of products as well as a provider of premium fall protection gear! We promote safe and efficient workplaces that comply with all OSHA safety regulations. Welcome to our online store, our team strives to provide you with the best possible online shopping experience. The engineering team that developed the Standing Seam Roof Anchor was also the first company to use non-penetrating clamps to attach Snow Retention systems to standing seam panels over 20 years ago. Years of lab and field testing has proven that our set screw attachment is the most effective method of attaching to standing seam panels. The Standing Seam Roof Anchor has been thoroughly tested by an independent 3rd party ISO 17025 testing facility. The product satisfies the 5,000lbs ANSI testing requirements with 2 different types of set screws, and with pull loads in all directions. The anchor is far stronger than any standing seam roof system in the world. The Standing Seam Roof Anchor was designed as the lightest and most universal fit anchor point in the world. It is also the only component system that allows for single worker attachment, walkboard attachment, horizontal lifeline attachment, and self retracting lifeline attachment all using the same anchor point. Fall Protection Distributors also provides a full line of fall protection equipment from harness, to horizontal lifelines, to retractors! Our goal is to provide the best equipment at the best possible price to keep you and your crew safe, profitable, and compliant. Please contact us by phone or email with any questions, comments or concerns about your order. Thank you again for visiting our store and we look forward to serving you in the future.